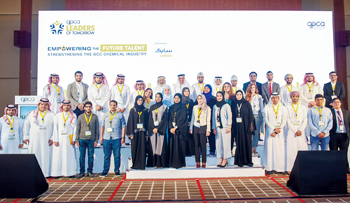 Leaders of Tomorrow, an initiative by the Gulf Petrochemicals and Chemicals Association (GPCA), aimed at building local human capital in the Arabian Gulf region, entered its third year during the 5th GPCA Research and Innovation Summit and 9th GPCA PlastiCon, which took place last month in Dubai. The sixth edition of the initiative was attended by 42 students from across the GCC. During the events, students were able to attend all conference sessions, network with senior industry leaders and learn about the innovation landscape and plastic industry in the region and globally. The seminar opened with a presentation by Dr Abdulwahab Al Sadoun, secretary general, GPCA, who emphasised on the significance of the chemical industry in modern day life, and the numerous career opportunities within the burgeoning petrochemical sector. A dedicated student-only seminar presented an opportunity to hear from senior industry leaders Fahd Al Sherehy, vice president, innovation and technology, Sabic, who shared his experience building a career in the chemical industry in the GCC, and Dr Moayyed Al Qurtas, chairman, GPCA Research and Innovation Committee, who highlighted the role of innovation in the polymer industry. In addition to the presentations, Dr Alaa Idris, a professor from the American University in Cairo (AUC), engaged with the students in an interactive session where the students were presented with a series of questions related to the conference.